Our laundry room was always the place where we put things we did not know what to do with, but thought we needed to keep. It quickly became a disorganized mess – a black hole – where things went in and were never seen again! Christina at Morris Organizing tackled our black hole, finding items we had forgotten and could not remember why we were keeping. In less than 2 days, she separated, organized and labeled everything in our laundry room! Even my husband was thrilled when he could walk in and find the doodad he needed to fix the grill! 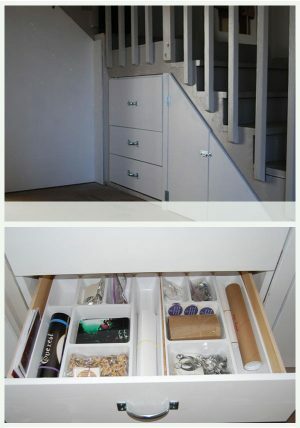 After 2 months, it is still organized and when I add something there is already a specific place and the best part – I can find it again! Thank you Christina! When I needed to have my children switch rooms so we could make room for baby # 3, I knew I needed to find a professional organizer who was not only great with kids but who had excellent creative storage solutions for small spaces. I turned to Morris Organizing and am so glad I did! Morris is professional, experienced and excellent with children. We received such a wide gamut of help and advice: from furniture placement to maximize space, to advice and solutions on how to minimize our mountain of stuff – from toys, crib, beds, and more. Morris sat down with each of my children and explained the organizing process and showed them how to sort their toys and belongings, and how to determine when to keep things and when to throw things away. In this whole process I felt the communication and expectations with Morris was spot on. I really appreciated how they respected my wishes regarding what and how I needed the kid’s rooms organized. Morris made me and my children feel at ease with what I thought was a monumental task! I am so thankful for the time spent on communicating with us and the incredible attention to detail. It was such a pleasure and a fun experience for me and my children to have Morris Organizing take care of such a big job! Storage has always been a big problem in our house, so the guest room closet became a catch all for all my purses, wedding dress, and lots of other items that didn’t have a home… Christina from Morris Organizing was able to offer much needed help to our jumbled closet. She arrived with a plan and in half a day, completely transformed our cluttered space. 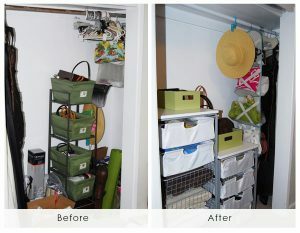 Now our new and improved closet looks great and has storage for towels, linens, all my purses and misc. objects too! Morris Organizing brought style, function, and purpose to our closet! Thanks for doing such a great job! It has been a good five months since the completion of your organizing adventure at management HQ, and the results are better each day. As you know after moving from a large offsite office, I decided to move my office into my home. This move provided special challenges that I had not intended. As I began in the new location, I believed that I’d be able to organize on my downtime and keep pushing forward with work. This just did not happen, and I realized I needed some guidance. Immediately I felt at ease with your demeanor and approach, and as I was combining work and home there were many sensitive documents that were out in the open that needed dissecting and either cataloging or removal. I felt so comfortable with you. Now my office is clean, and things are in their place. My original idea was always to have a place for all my immediate office needs, and I knew it would fit, but my organization was lacking. You have changed all that, and in a manner that lasted. I cannot thank you enough for your assistance, and I have recommended you to many of my colleagues who need assistance. Thank you again for everything! 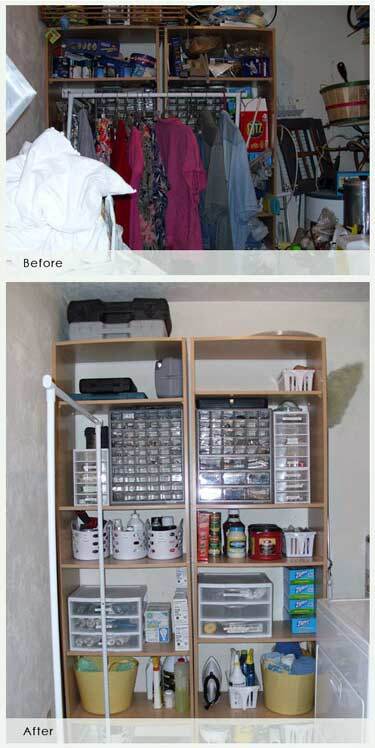 Working with Morris Organizing was some of the best money I have ever spent. For years it had been my goal to organize my home, to minimize clutter, and have a space where I could come home and truly relax. As a busy entrepreneur, focused on trying to grow my business, I realized that I would probably never accomplish this goal on my own. I got in touch with Christina, and we met for our initial consultation. She was very upfront and honest as far as how much time she thought something might take, and I appreciated her willingness to work with my style. I had some fears in working with an organizer that one might come in and impose their own organizational system on me which may or may not fit. But Christina is so wise and such a good listener at determining her clients’ needs that she finds a system that works best for you. My employer requested that I cull together all of his professional photographs and clippings and organize them in chronological order. We’re talking nearly fifty years and still going strong. With my other many obligations of my day to day work, I realized that it was an undertaking too big for me to handle on my own. When I first met Christina, I new it was a love match. She had so many constructive ideas, which included the huge task of taking digital images of every photo and clipping, then saving them with and without captions. She had beautiful albums made with archival materials. And now, if we need to refer to a specific photo we have the digital image with or without caption that we can easily download and send.